Far from the shadows of Coruscant’s skyscrapers lies the dangerous Outer Rim. To many citizens, the galaxy's edge represents a hive of scum and villainy that is better left ignored. But to the scoundrels of the galaxy, the Outer Rim represents opportunity. If you can survive the harsh conditions of the edge of space, you may just find yourself emerging from the grime of the underworld as one of the most famous scoundrels in the galaxy. 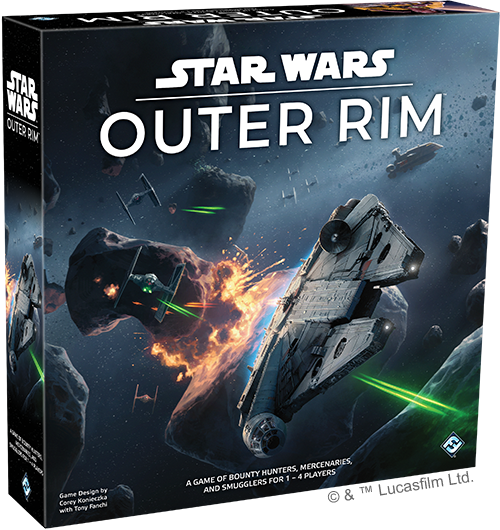 Fantasy Flight Games is proud to announce Star Wars™: Outer Rim, a game of bounty hunters, mercenaries, and smugglers for one to four players! But it won’t be easy. The warring factions of the galaxy roam the Outer Rim, hunting down the scum that have proven to be a thorn in their side, and other scoundrels looking to make their mark see you as the perfect target to bring down and bolster their own reputation. Do you have what it takes to survive in the Outer Rim and become a living legend? A game of Outer Rim takes place over a series of turns that sees players taking dangerous jobs, tracking down bounties, upgrading their ship, and more, all in service of gaining more and more fame. Regardless of the path you take to get there, the goal of Outer Rim is to gain ten fame, cementing your place in the legends of the Star Wars galaxy. 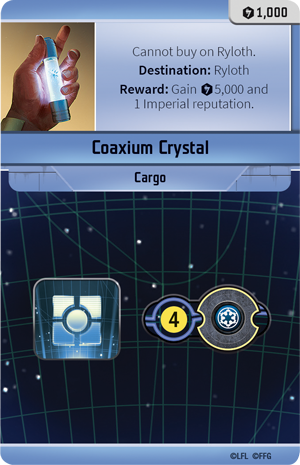 Gaining this fame can come from a variety of sources, such as completing your character’s personal goal, collecting on bounties and jobs, delivering illegal cargo, taking down patrols from the various factions struggling over the galaxy, and enjoying the finer things in life by purchasing luxury items with your hard-earned credits. While the path to victory may be different for scoundrels finding their way in the Outer Rim, everyone starts from the bottom with a simple starship. 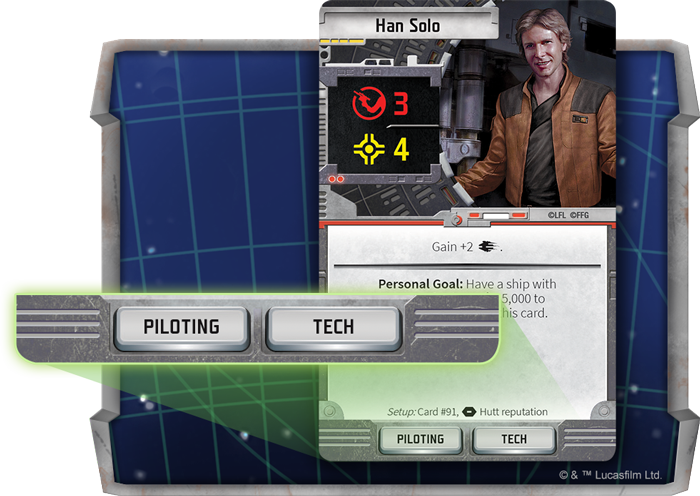 Your player board not only tracks your fame progress, but also contains slots for your ship, your character card, gear, reputation, modifications, jobs, and bounties. The player board is the hub of your adventures in Outer Rim, with spaces for your ship, your character, your jobs and bounties, crew, modifications, and much more! Of course, you can’t become a legend by idling on planets and staring at the stars. You’ll have to take your ship across the galaxy to build your fame. You’ll have to traverse dangerous hyperspace routes between the farflung planets of the Outer Rim, avoiding hostile patrols, devastating maelstroms, and deadly encounters as you build your legacy. The wealth and danger of the Outer Rim is laid out before you! In performing your jobs you’ll have to avoid patrols from the Hutts, Crime Syndicates, Imperials, and Rebels. While these patrols can be nuisances that stand in your path, destroying a powerful patrol can increase your fame, and doing jobs for any of these factions can turn them into helpful allies—but helping one faction may harm your reputation with the other major factions of the galaxy, encouraging them to hunt you down wherever you may hide. Even if it's not glamorous, you won't get far without a ship. Every would-be legend begins with a starter ship that gives you the opportunity to take your first steps into a larger world. But as your legend grows, so do your resources, and as you find success you can improve and upgrade your ship, even trading it in for a newer model like a modified YT-1300. By meeting certain conditions, you can even transform these ships into iconic Star Wars vessels like the Millennium Falcon! 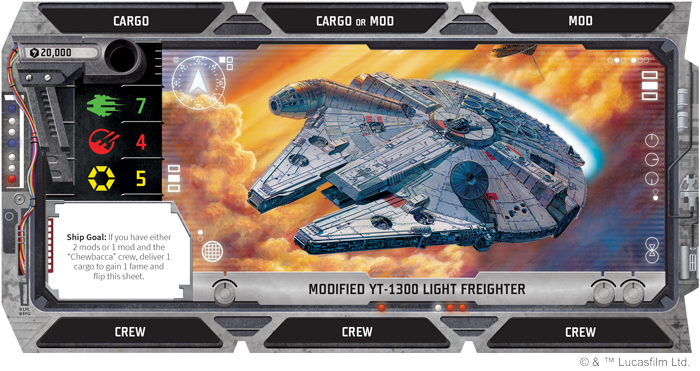 It might be just a modified YT-1300 light freighter for now, but once you meet your ship goal, you can flip the card over to reveal the Millennium Falcon! But what’s a ship without a pilot? One of the most exciting aspects of Outer Rim is stepping into the shoes of some of the most iconic scoundrels in the Star Wars galaxy. Each of the eight character choices has their own skills and and their own personal goal to help them become famous or infamous throughout the Outer Rim. Search for the fastest ship in the galaxy with Han Solo or hunt down dangerous bounties with Boba Fett. Sabotage Imperial bastions with Jyn Erso or make a fortune from illegal cargo with Lando Calrissian. Once these characters achieve their goal, they gain fame and more powerful abilities that will undoubtedly prove useful as they continue their journey through the Outer Rim. Characters and crew also contain various skills to help you on your journey, from experts in influence like Lando Calrissian to masters of stealth like Doctor Aphra. 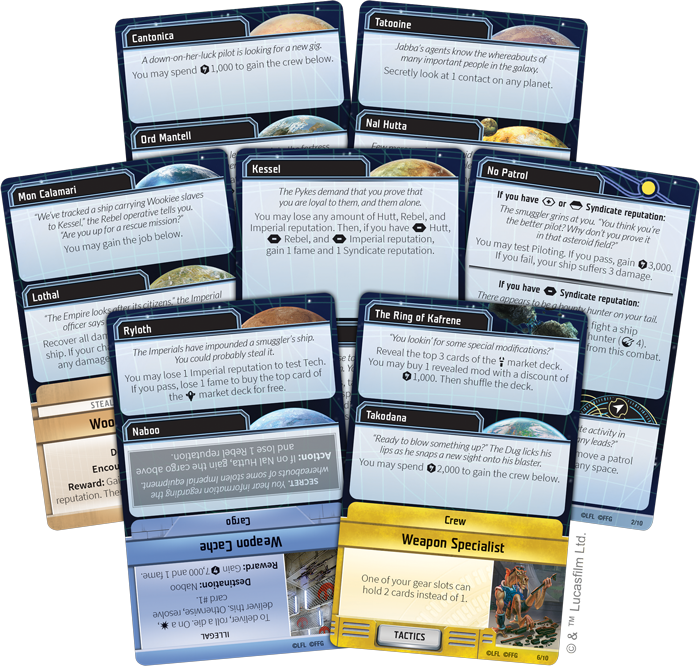 These skills will come in handy during your journey across the galaxy: at the end of your turn, you’ll draw an encounter card based on your space. The Star Wars galaxy is brimming with action and adventure, and every space has its own story to tell. These encounters could see your legend growing, but only if you have the skill to navigate them. Many encounters will ask you to test a specific skill, such as luring someone into a high stakes game of sabacc with your influence, or using your stealth to help a Rebel cell steal some gear from an Imperial garrison. Succeeding in these encounters can bring you fame and credits, while failure can leave your ship damaged, your reputation ruined, or worse. These dice are also used during combat, and during jobs, which are more in-depth encounters with branching results based on your skills. With factions on your tail and the dirty allure of the Outer Rim constantly calling, a job is never as simple as moving some cargo. 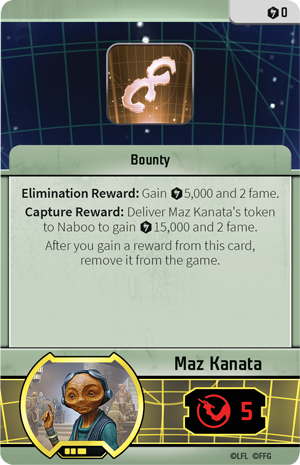 Will you make a name for yourself by hunting bounties for the Hutts, stealing for the crime syndicates, or smuggling goods past Imperial patrols? All this and more is possible as you adventure through the outskirts of the known galaxy. 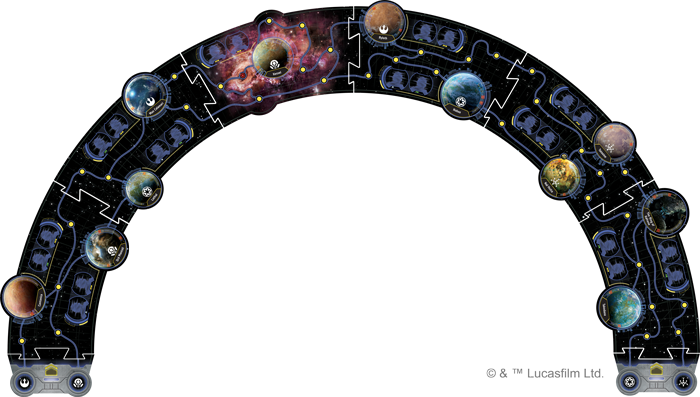 Set your coordinates, gather your crew, and make the jump to hyperspace with Outer Rim! Create your own legend and pre-order Star Wars: Outer Rim (SW06) through your local retailer today! Look for Outer Rim to release in the second quarter of 2019. 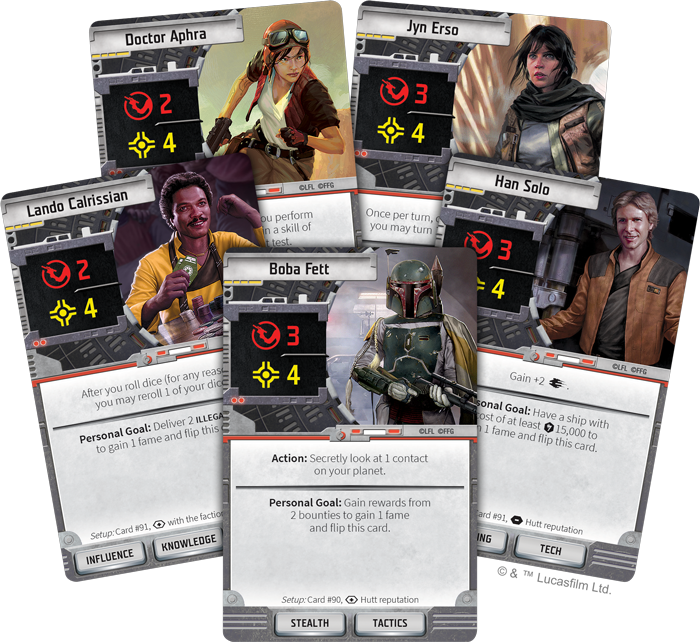 Star Wars™: Outer Rim is the boardgame of bounty hunters, mercenaries and smugglers for one to four players. Take control of one of eight iconic Star Wars scoundrels and gain fame by delivering illegal cargo, hunting down bounties, and more! What stories await you on the Outer Rim?